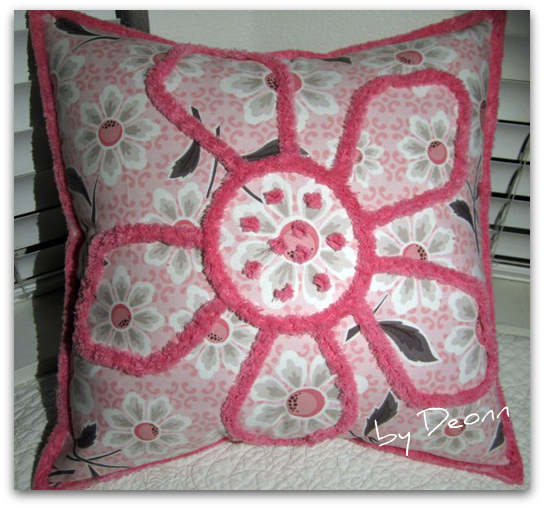 Sewing, Quilting, Needleworking or Crafting! Simple h(art) quilting to make a fabric card, wall hanging, or little prayer flag to send to someone who needs it! You don't even need a pattern for some thing like these! My String Pieced Prayer Pocket Pillow make with strings or solids and use the little pocket in the back...for sending good wishes of any kind! 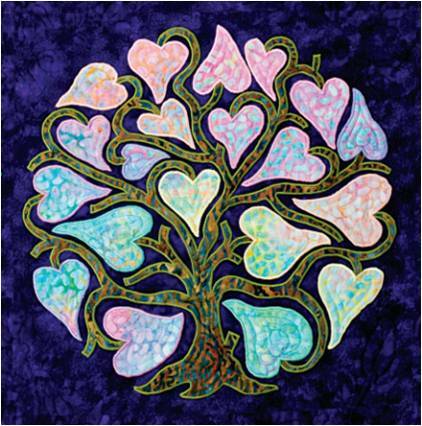 perfect for post surgery for either cardiac or breast cancer patients, hugging a pillow over the heart after cardiac surgery or under the arm after breast surgery have been shown to help significantly with post-operative pain. 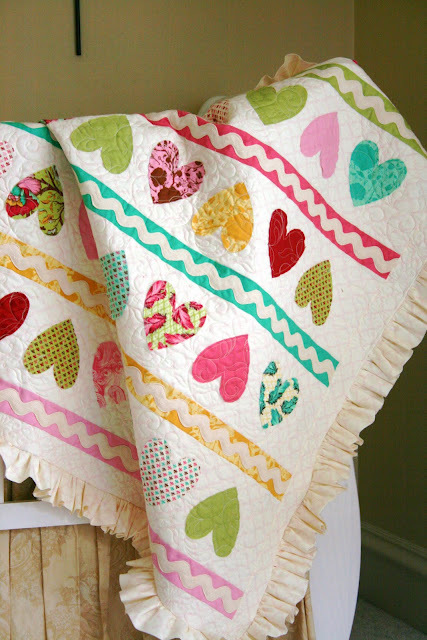 My own simple quilt and applique a heart on top of its blocks! 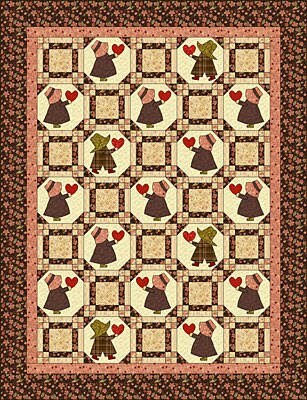 Click on the PICTURE to Download the Free Pattern from Cindy Carter! 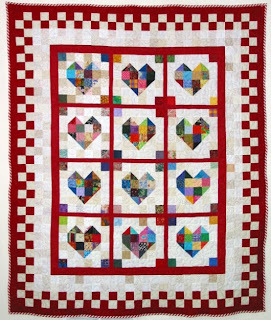 Terri at Quilternity’s Place (hearts above) is sharing a couple of free heart quilt patterns on her blog. Twisting Heart Valentine Tutorial..this one is just 18"..use it for a carseat cover, a wallhanging, or a pillow"
Download your FREE Nine-Patch Heart Block pattern from link below. 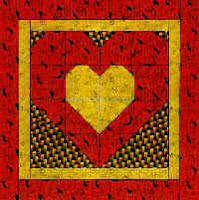 Refer to the McCall's Quilting issue shown below for the Heart of the Home quilt pattern by Jackie Robinson. 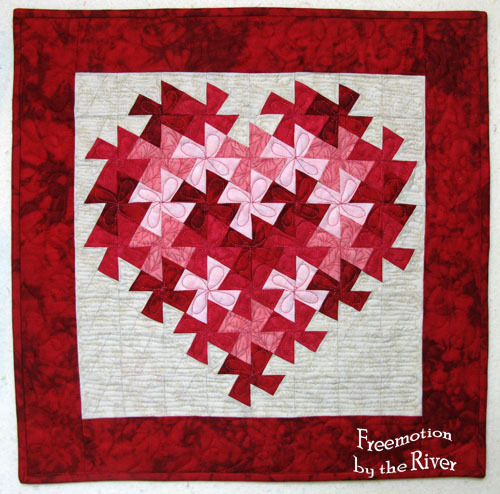 Click here to download their FREE Nine-Patch Heart Quilt Block Pattern from their FREE online Quilt Block Reference library. 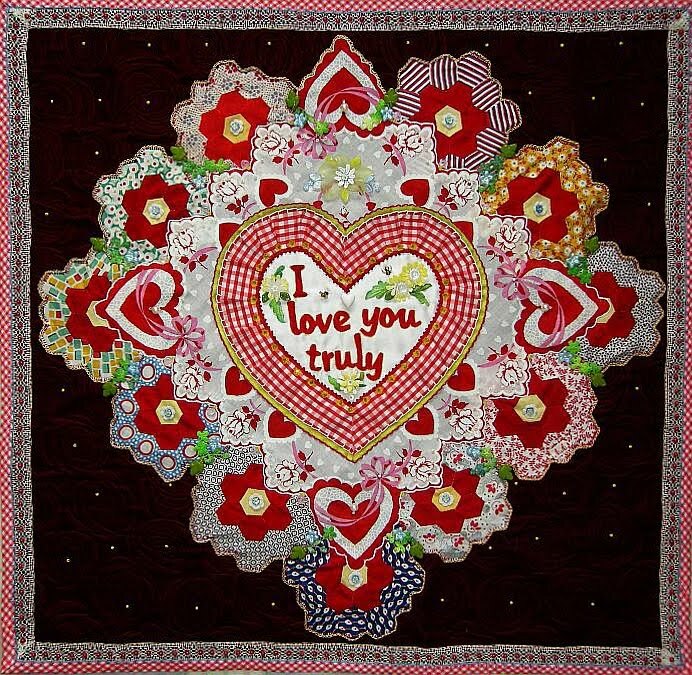 Have fun designing your own Valentine's Day quilts. 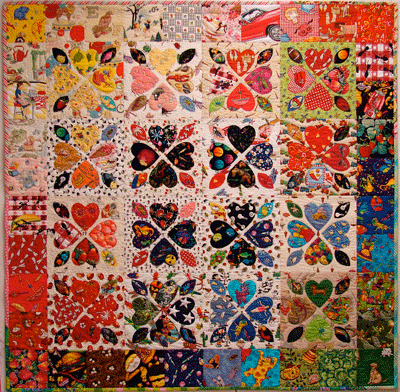 The Valentines blocks shown here each finish to approximately 8". Make one block and frame it, or assemble a group of blocks into a quilt. 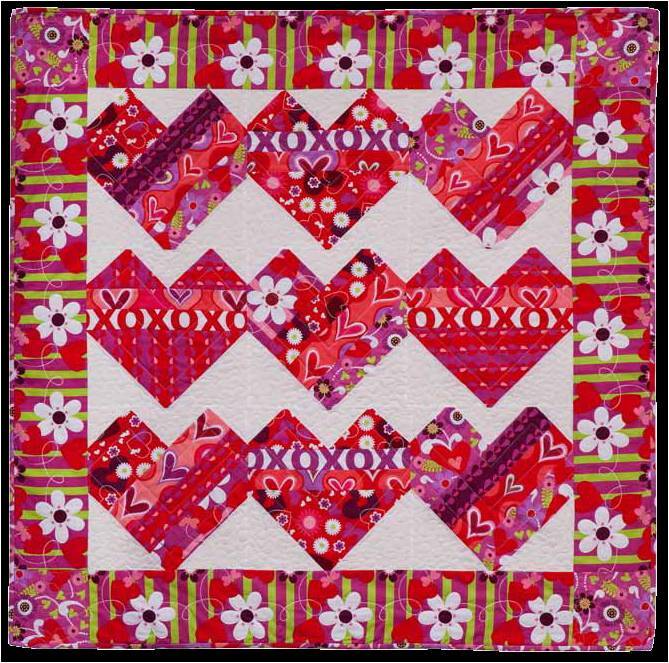 By mixing fabrics and block styles and alternating sashing between blocks, the possibilities are endless. Cut one 2.5" strip of light fabric. Cut one 2.5" strip of dark fabric. Lay strips right sides together and cut eight Easy Angles. 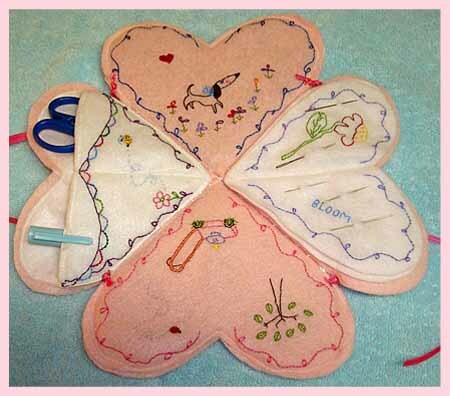 Do not separate the sets - they are ready to sew. Cut six 2.5" squares from the dark fabric and two 2.5" squares from the light. Sew the Easy Angle sets to create Easy Angle units. Sew Easy Angle units and squares together following diagram below. Press seams in direction of arrows. Cut 1 1/2" strips for 1" finished squares. Ten dark 1 1/2" squares. Fifteen light 1 1/2" squares. Cut two light 5 1/2" & two light 7 1/2" strips. Cut two dark 7 1/2" & two dark 9 1/2" strips. 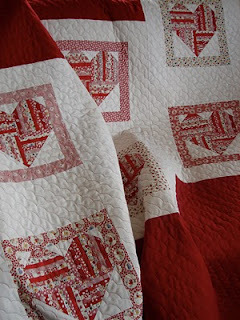 Sew short strips of light fabric to top and bottom of block, then to sides. Repeat with dark fabric. Cut one 2.5" strip of background fabric. 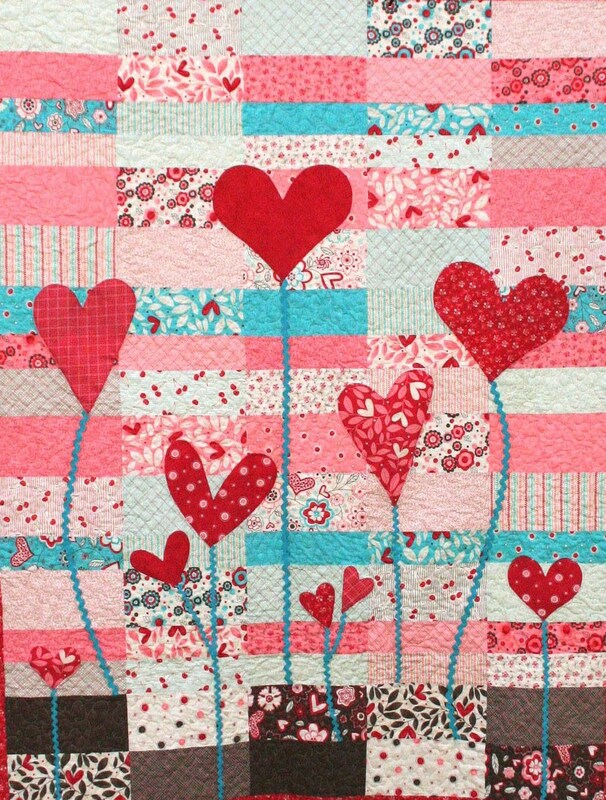 Cut one 2.5" strip of heart fabric. Lay strips right sides together and cut eight Easy Angles. 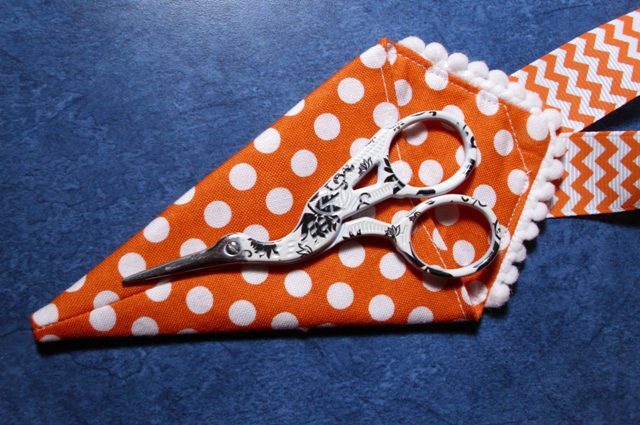 Do not separate the sets - they are ready to sew. 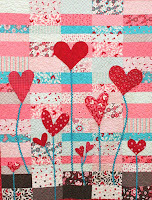 Cut four 2.5" squares from each of the background and heart fabrics. 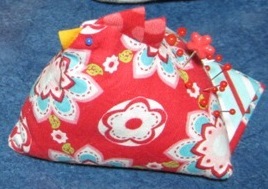 Sew Easy Angles together to form Easy Angle units. Sew Easy Angle units together in pairs as shown below. Make two of each pair. 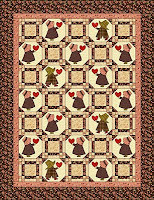 Sew background squares together to form two sets of pairs. 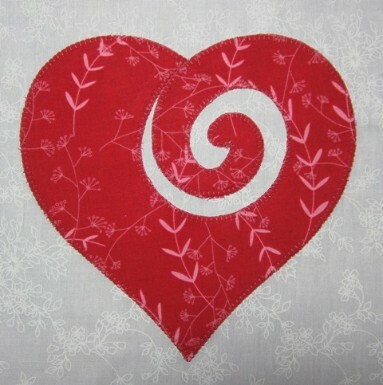 Repeat with heart fabric. Assemble block as shown in diagram below. Press seams in direction shown. Cut one 2.5" strip background fabric to yield four Recs. 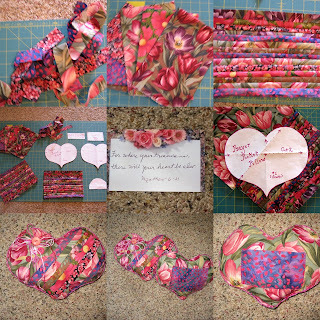 Cut one 2.5" strip of heart fabric to yield two Tris. Cut one 4.5" strip of background to yield two Recs. Cut one 4.5" strip to yield one Tri. Cut one 1.5" strip and one 2.5" strip sashing fabric. Sew 2.5" recs to either side of 2.5" Tris to make a two triangle in a square units. Sew small triangle in a square units together side by side to create top of heart. Sew 4.5" recs to either side of 4.5" Tri to make one triangle in a square unit. Measure width of heart unit and cut two 1.5" sashing strips to fit. 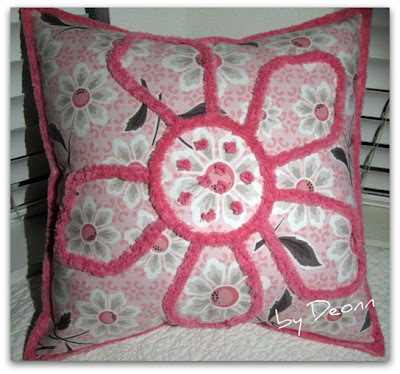 Sew one each to top and bottom of unit. Measure length of heart unit and cut two 2.5" strips to fit. 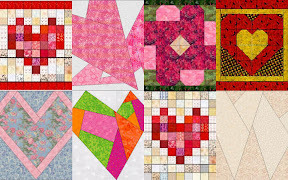 Sew one to each side of blocks to complete. Cut one Companion Angle™ from 4 1/2" strip of dark fabric. 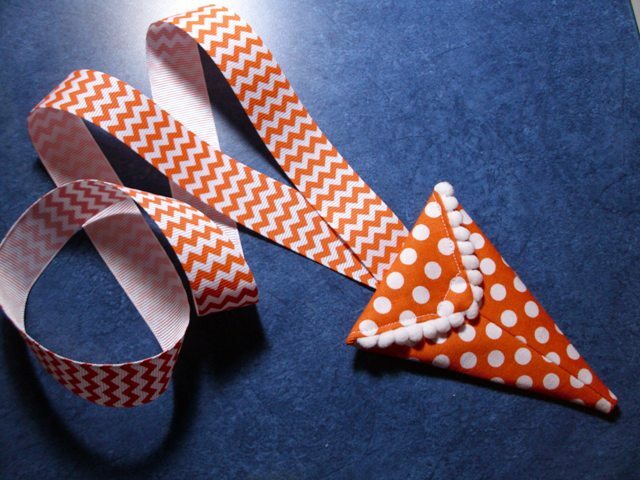 Cut one pair of Easy Angles™ from 4 1/2" strip of light fabric. Sew Easy Angle™ triangle to either side of Companion Angle™ triangle to complete flying geese unit. 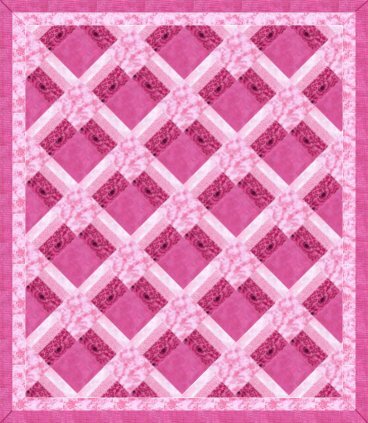 Cut six Companion Angles™ from 2 1/2" strips of light fabric. Cut two Companion Angles™ from 2 1/2" strips of dark fabric. 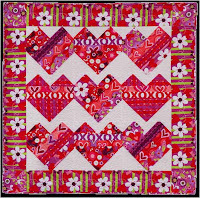 Sew two triangles together as shown to make a half square, then sew two half squares together to create each block. 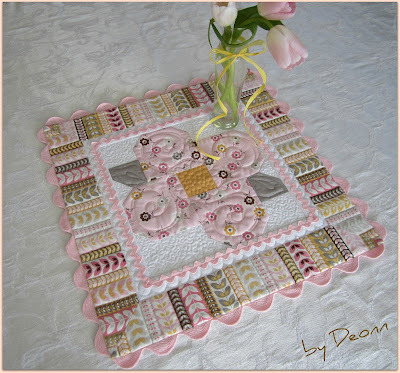 Sew quarter square blocks together. Sew to flying geese unit to complete block. Use drawing above to make another little Sue for a card or a quilt block! 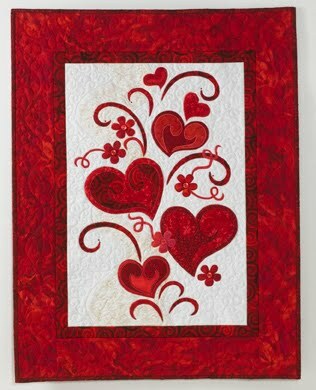 Choose the woven heart, the bow heart or the star heart to send a message of love and friendship. Sorry for the missing photos below. I'm working on them. Sometimes, websites close or change web addresses, sometimes things just go wrong ! 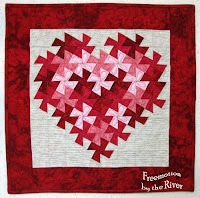 Pat Sloan's Heart from her book club and lots of other free patterns! 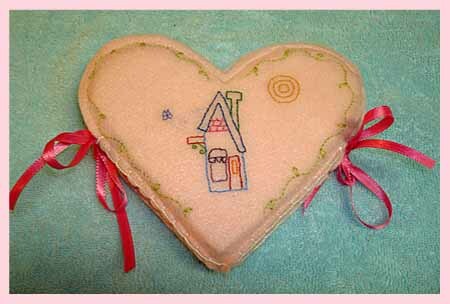 HowStuffWorks "Quilted Hearts on Your Pillow Pattern"
tiny tutorial ~ Valentines: Jane LaFazio's handsewn felt hearts and painted rocks..
does it get any better than this??? There is something extra special about receiving a handmade Valentine. These Valentine ladybugs are a cute way to let someone know how much you care. 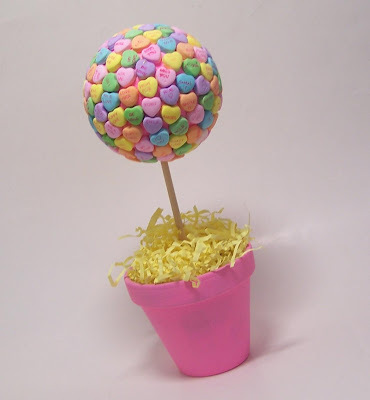 It's a fun and easy project that even the kids can help out with. You can make one or a whole class set of these adorable love bugs. It's okay to be creative with the colors. This is a great way to use up some of the bits of scrapbooking paper you may already have. Table Topper, 20" x 20"
What's in YOUR Sewing Kit? ;;And Just For Fun! 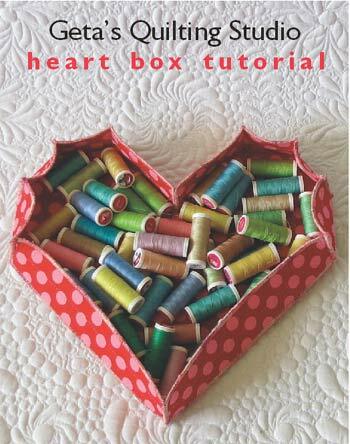 Free Patterns for Hearts to knit or crochet! 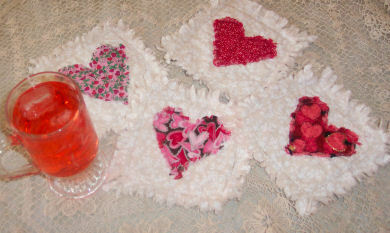 At Crochet Memories: Interlocking hearts made with worsted weight yarn. 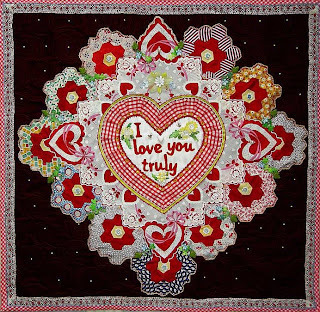 On this site - About Crochet: A triangle shaped shawl pattern that I created, featuring my Connected Hearts charted design. Wow! So many ideas and possibilities. Thank you for compiling all this and sharing it. Oh my! So many beautiful projects - so hard to choose! My word girl!!! Only you with a heart bigger than Texas would ammas such an amazing list of opportunities. So many great ideas and oodles of inspiration! Thank you so very much for putting this together Michele! what an incredible selection of heart projects that you have gathered here~!! i especially loved the felt envelopes with the painted rocks~! your clever recycling/reusing gift bag was fun too. Thank you! I can't imagine how much time it took for you to compile the info for this post and to place all the links in it. 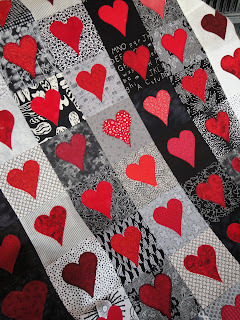 There is an amazing variety o heart projects here, but I am going to check out VERY many of the links. Hearts are the best.